ALSO! This week Amazon opened two new marketplaces where you can buy KDP books (including mine) – CANADA and BRAZIL. A detailed and fast-paced historical fantasy based around the turbulent opening of Japan to the West in the middle of the 19th century, “The Islands in the Mist” is the third volume in “The Year of the Dragon” saga. I’m slowly gathering a substantial collection of reviews for my “Year of the Dragon” books. The variety of opinion is sometimes difficult to cope with, ranging from “couldn’t put it down” to “trite and mediocre” (as is, I suppose, a case with any book) – but one thing a majority of my readers seems to appreciate is the world-building in the novels. With few exceptions, the world-building is mentioned in superlative terms and pointed to as the main strength of the story. This is, of course, on one hand very flattering. I’m glad there are easily definable strengths to my writing, I’m happy to see somebody appreciates all the effort I put into the world of “The Year…”. But, on the other hand, I find it symptomatic of a greater problem with fantasy books in general. I was always a bit worried with the increasing prevalence of praise for “world-building” in reviews of fantasy novels. I guess I’m old fashioned, but, to me, praising a fantasy writer for world-building is a bit like praising the builder for putting up scaffolding. Creating a rich enough setting is a given; the most basic starting point. This is what separates fantasy (and science fiction, to an extent) from other literary genres. Otherwise, why would you even bother writing fantasy? Why not set your story simply in medieval Europe, or renaissance China, or modern London? Whether I start writing with plot, characters or (as in the case of “The Shadow of Black Wings”) setting, building the world is the crucial part of creation. I agree that sometimes it can get… excessive. The picture attached to this post is one of the TWO maps for the Dragonbone Chest novella. That’s right, a stand-alone 30k work required a world rich enough to get two maps (there was a third map, actually, but I omitted it as only 10% of it actually showed in the novella). But I wouldn’t have it any other way. Call it obsessive, but I need to know that the Moon phases in “The Islands in the Mist” match the original Moon phases in May 1854, or that the way the mistfire engine works is consistent with what I’ve written about elementals twenty chapters earlier – even if none of my readers will ever notice that sort of detail. I need to have two thousand years of the world’s history written down, and detailed maps of the entire planet made before I even start the first chapter. Personally, I blame Tolkien; Lord of the Rings was one of the first books I remember reading, and the first book I read in English, and is still the most important book in my life, by far. Cutting corners when creating the world would feel like betraying Tolkien’s legacy. And maybe this is why I find it difficult to read a lot of modern fantasy. Yes, there are great builders out there, and they are rightly among the most popular fantasy authors. Obviously a rich and detailed world is something that’s still appreciated by the majority of readers. But the fact that they are becoming rare, that proper world-building is something worth pointing out and exceptional praise, is what worries me. Or maybe I’m just too old school. That’s right! The third volume of the Year of the Dragon saga is now available on Amazon and Kobo – see links on the sidebar. The story continues at a brisk pace. New characters appear, and the old acquaintances are met again… sometimes in surprising circumstances. Saved by the mysterious samurai, Bran, Nagomi and Sato head towards the Kirishima Shrine, where the dragon is held captive under the careful watch of Satsuma’s Arch Wizard. But they are not the only ones who are keen to get their hands on the prize. The Black Wings have landed, and the Taikun’s court at Edo is in turmoil. So is Kiyo, after the recent disturbing events. Doshin Koyata receives a strange blood-red signal in his dreams and departs in search of its source. The fourth volume, “The Rising Tide” is expected early next year. Also, don’t forget to check out my epic fantasy novella, “Dragonbone Chest“! The Islands in the Mist – TYOTD Vol. 3 COMING SOON TO AMAZON NEAR YOU! 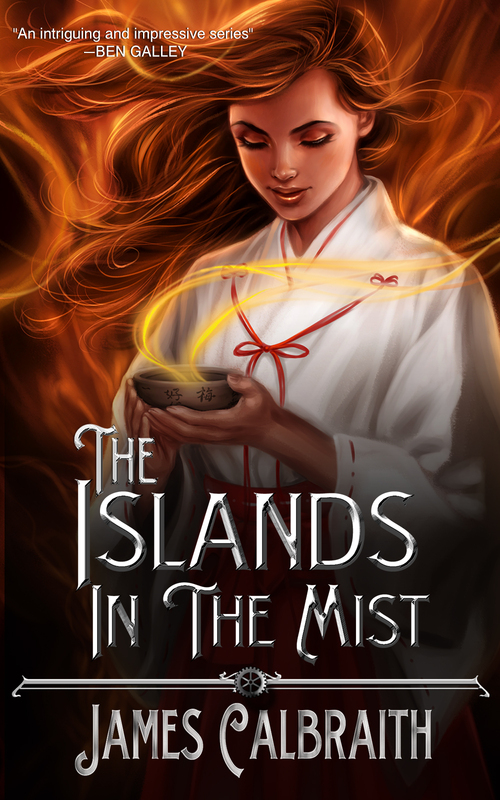 The launch of The Islands in the Mist is scheduled on October the 8th.